Why make your own soap? Soap it is not expensive, it is readily available in any grocery store, it cleans, sometimes makes your skin a bit dry, but that is what the creams are for, right? 1. You have direct control of the soap ingredients! Well, it’s like with baking or cooking. Sometimes you just feel like preparing something on your own, just to your taste. And after all, who would like to eat all the time in the restaurant, being dependent on their menu? Or who would like to eat all the time the low quality pre-processed-in-the-microwave-heated junk food? Industrially produced soaps are sometimes much like that junk food. Low-price, composed of cheap and non-ecological ingredients, offering nothing more than cleaning. Why? Well, it is much easier and cheaper for the large scale production, I guess. 2. It is relatively easy! Remember, it is really not difficult to make soap at home. Not more than making a cake. There are different types of cakes, though. Some of them are very easy to make, some of them are more complicated. 3. Your own soap has an additional value – it can do much more than just cleaning! It can be an inspiration, an artwork, your personal masseur, gentle peeling, cleaning friend when you really need it after gardening, or just bubble producing fun-maker, all while stimulating your senses by its form, colors and scent. 4. Your own soap contains naturally a good proportion of glycerin and other goodies ! OK…now you think – and what is wrong with industrial soap being pure? Isn’t purity a sign of quality? Well, not always… Pure soap is soap that was cleaned of everything that is not soap – including oil unsaponifiables (see below) and all what is being created in the reaction. Then fragrances and colors are added and soap is milled into forms. The problem is that the most important impurity that is created in the saponification reaction (this is how we call the process of soap creation) is glycerin – an exceptional moisturizer and carrier that is then extracted and sold to pharmaceutical, cosmetic and food industry. What a pity – for us! When you make your own soap at home (and it is really not more difficult than making a cake), the glycerin stays. And that is sooo soothing for our skin . 5. Home made soap is tolerated by the most sensitive skin ! You can read everywhere that home-made soap is very well tolerated even by the most sensitive or problems-prone skin. I myself do not suffer any pathological skin condition, however, some of my friends confirmed to me that their eczema or psoriasis prone skin just loves my home-made soaps. 6. You can create any soap you want – because only you know what you really need and wish! If you make your own soap, you directly control all the ingredients and you can design it according to your desires. Imagine the horizons! Start making your own soap and you can make literally any soap you want… imagine soap with jojoba oil. Or pure olive oil soap! 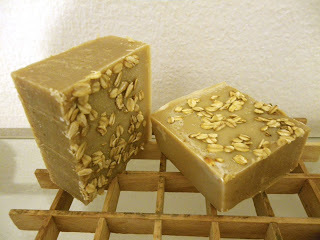 Would your skin prefer a sunflower soap? And what if you add lavender flowers? Or honey… and milk! 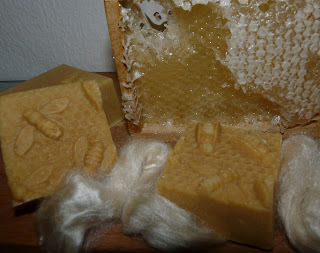 Soap with honey and milk, how cool is that! Or yogurt? Goat milk soap scented with chocolate and vanilla! Miam! Would you like a soap that gets rid of unwanted smell on your hands? – add coffee! Peeling soap for your shower? Grounded oatmeal or dead sea mud are the best! Or wait, you do not want a bar soap? What about transparent bar soap? Or do you prefer liquid soap? I tell you a secret – there is also a cream soap – a soap that looks and feels literally like a cream! Really! Oh, I forgot the whipped soap… it floats on the water, a real delight…. 7. It is a perfect, original and highly appreciated gift! Pack your soap nicely and you have a perfect gift for your family of friends (although I warn you – they get pretty soon accustomed to your soaps and will be expecting you to bring them on each occasion…). You might have been lucky and know your local soapmaker. You already know how excellent a home-made soap can be. Well, you can see his world from inside! This is how I feel about making soap at home. It is a never-ending creative adventure. There are thousands of webpages and blogs dedicated to soapmaking. This is extraordinary. A few years ago, it was impossible to share experience on such a large scale. All we had were books. Now the soapmaking community is so large worldwide, it is astonishing. BUT BEWARE! Making soap is really addictive! You will dream about soap, a visit to your local grocery store will suddenly become completely different as you will watch everything through soapmaking glasses! Do you know any more reasons why to make your own soap? Just write them in the comments, I would love to read them! Fluhr JW, Gloor M, Lehmann L, Lazzerini S, Distante F, Berardesca E. Glycerol accelerates recovery of barrier function in vivo. Acta Derm Venereol. 1999 Nov;79(6):418-21. 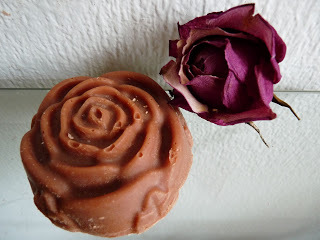 This entry was posted by evik on October 16, 2012 at 23:59, and is filed under soapmaking, soapmaking basics. Follow any responses to this post through RSS 2.0.You can leave a response or trackback from your own site. Very informative site! Am about to try it for the first time. Is there a substitution for lye? I’m concerned about handing this ingredient.